And here’s the thing about gardens. They don’t have to be big, formal, organised gardens like some we’ve featured this week. And they don’t have to be commercially productive, or a big tourist attraction, or functional in any way. Some gardens, of course, are tiny – and don’t have any function other than to bring a little joy into the lives of those around. That’s how I see the hanging baskets that (sometimes) adorn my back deck (when they haven’t died!) 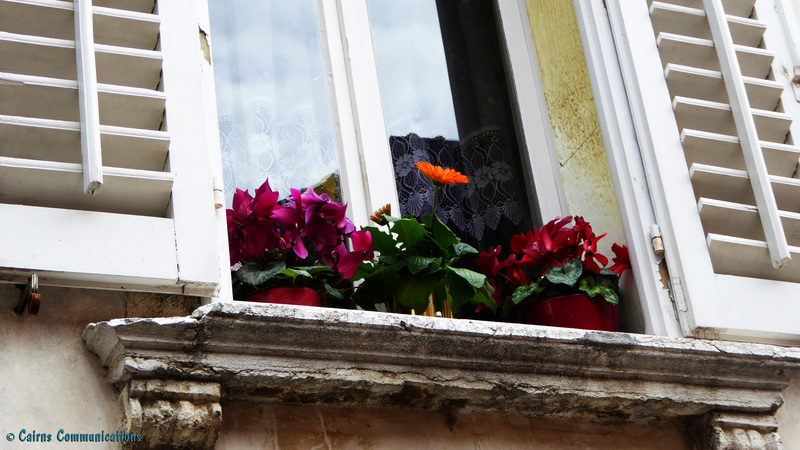 – and I suspect that’s how an anonymous apartment-dweller in Koper, Slovenia sees their window-sill garden. We were wandering around this lovely small city of 25,000 people, just across the border from Trieste in Italy, taking pictures of everything that took our eye when we spotted this lovely splash of colour soaking up what sun was available on a somewhat cloudy day. I was captivated with the contrast between the potted plants and the decaying concrete window-sill, and the shutters and the lace curtain. But lots of things in Koper captivated us. But because tourism is still a growth industry here, the city has a less ‘frenetic’ feel than other ports on the Dalmatian coast – like Dubrovnik, and Kotor. Koper dates back to the times of the ancient Greeks, when it was known as “Goat Town” – it’s also been known as Justinopolis, and Capodistria – or “head of Istria”, from its days as the capital of Venetian Istria. The city fell on hard times, however – especially in the 16th century when it was hit by multiple outbreaks of the plague – and by early in the 20th century there were fewer than 7500 residents. Since then, it’s grown – partly because it is the only commercial port for all of Slovenia. It’s officially bilingual (Italian and Slovene), and as I say, it’s not as ‘tourist-oriented’ as many other ports. For example, I decided to get a haircut in the town – but the sole hairdresser spoke no English. I speak no Slovene, and could manage only the most appalling Italian. If you find yourself in Koper, make sure you check out the 15th century Praetorian Palace, and the Loggia – the town hall on the opposite side of the city’s main square. In the narrow, brick-paved laneways leading away from the square, you’ll find small shops, and cafes, and taverns – and a fascinating little bookstore where I found myself poring over an amazing range of books – many of which were obviously pre-loved, and well-thumbed – as befits a bookstore in a town which houses the University of Primorska. And as you wander through the labyrinth of streets, just above your head are the apartments of Koper’s residents – and the window-box gardens that brighten their windows.